Direct Scaffold Services is an expert in furnishing pedestrian sidewalk canopies; or sidewalk bridges / sheds as they are commonly called in other parts of the country. 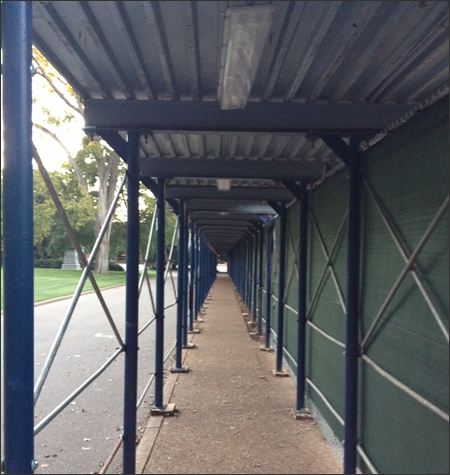 Canopies are sometimes required by city codes to protect the sidewalk under any overhead construction project; whether it is light duty maintenance, heavy facade repair, or new construction. CAE offers various configurations of sidewalk canopies with load ratings from 150-300 lbs/sqft, to ensure that each project is furnished with the most cost effective form of pedestrian protection. Direct Scaffold Services is Mississippi's foremost expert in sidewalk protection. Contact us today for help with a sidewalk canopy at your job site. Copyright Mississippi Scaffolding. Direct Scaffold Services. All Rights Reserved. Website by My Discount Websites. We provide the best scaffolding throughout Mississippi in such areas as Jackson, Gulfport, Southaven, Hattiesburg, Biloxi, Meridian, Tupelo, Greenville, Olive Branch, Horn Lake, Clinton, Pearl, Ridgeland, Starkville.